We can agree that the killing of Jamal Khashoggi was a crime that never should have happened. The Saudi authorities have carried out a thorough investigation. Those involved will be punished. There have been 18 arrests. The Saudi attorney general seeks the death penalty for five ringleaders. The unfortunate incident has dominated television news reports and discussions since the victim’s demise on October 2 grabbing far greater airtime than the ‘invading’ migrant caravan, major natural disasters, mass shooting attacks and Britain’s journey into unknown territory. Given that this Saudi national with Islamist sympathies was hardly an A-line celebrity or a head of state, it seems to me that the coverage has been and still is total overkill. Let us also remind ourselves that Khashoggi wasn’t American or French or British. He was a Saudi former adviser to the ex-head of intelligence turned dissident who met his end on Saudi sovereign territory. The kingdom has graciously cooperated with Turkish investigators when it could easily have told the world to mind its own business. Let us remind ourselves of a legal memo from Barack Obama’s Department of Justice authorising the extrajudicial assassination of American citizens. Indeed, three US citizens were targeted and killed by drone strikes in September 2011 alone. In May 2012, the New York Times reported that Obama personally approved targets on a “kill list” fuelling a debate on ethics and legality. The president of the Philippines has actually urged his citizens to murder suspected drug dealers and addicts. Thousands have been killed without a word of disapproval from the Trump White House. Indeed, the US president has heaped praise on his Filipino counterpart. The question is why does this story still have legs when more than six weeks have passed and the perpetrators will face trial? Moreover, why are so many Western governments, among them the US, expressing such outrage and threatening repercussions? There was no such brouhaha over Israel’s murder of dozens of Palestinian residents of Gaza or its botched infiltration of the Strip to kill a commander of Hamas’ military wing that brought Israel and Hamas to the brink of full scale conflict. The fact that 14,000 immigrant children are in American custody or London, that has witnessed 121 murders this year alone earning it the reputation Britain’s ‘Murder Capital’, hardly get a mention. I believe the Kremlin is on to something when it has decried the politicising of the case, calling it “unacceptable”. The Turkish government has been drip feeding lurid details and sharing audio tapes with foreign governments that have no stake in Saudi’s internal affairs. It is no secret that Turkey’s relationships with both the kingdom and the US have been fraught. Working to discredit Saudi Arabia benefits its Gulf financial backer and it seems President Donald Trump is now considering extraditing Fethullah Gulen, a US resident who Turkey accuses of being behind the failed coup. Turkey could have dealt with the problem behind closed doors but instead chose to drag it out and make a public meal of it. Moreover, why is nobody asking how Ankara obtained the audio tapes? Evidently the Saudi Consulate had been illegally bugged. Then on Saturday, the CIA, whose reputation for attempted assassinations of foreign leaders and its renditions of suspects who’ve been tortured in black sites, publicly claimed that it had concluded the Saudi Crown Prince gave the order to terminate Khashoggi purely based on intercepted phone calls, none of which mention Prince Mohammad Bin Salman. So not only is Turkey spying on foreign diplomatic missions, the CIA is listening-in to private telephone calls. These shenanigans are looking more and more like a set-up to gain leverage over Riyadh. Whereas Trump is keen to maintain close US relations with Saudi that he considers as an important ally, he is being backed into a corner. Vice-President Mike Pence is warning of repercussions in light of the CIA’s speculations. It’s no secret that Washington wants to pressure Saudi authorities to end the war in Yemen, increase oil production to boost US corporations and jobs and to mend fences with Qatar, home to the largest US military base in the region. US lawmakers are now clamouring for the release of women activists in Saudi prisons. “The Qatari media has launched an organised campaign against Saudi Arabia and are exploiting Khashoggi’s case, said the Saudi Foreign Minister Adel Al Jubeir. Khashoggi, once pictured with Arab terrorists in Afghanistan proudly wielding an assault rifle, was a man with secrets. In recent days, it emerges that he married an Egyptian woman he had known for a ten years in the US in June; a disclosure he hid from his so-called Turkish fiancee Hatice Cengiz who has accused his wife of trying to sully Khashoggi’s reputation. Witnesses have confirmed the marriage took place supported by numerous photographs of the ceremony. 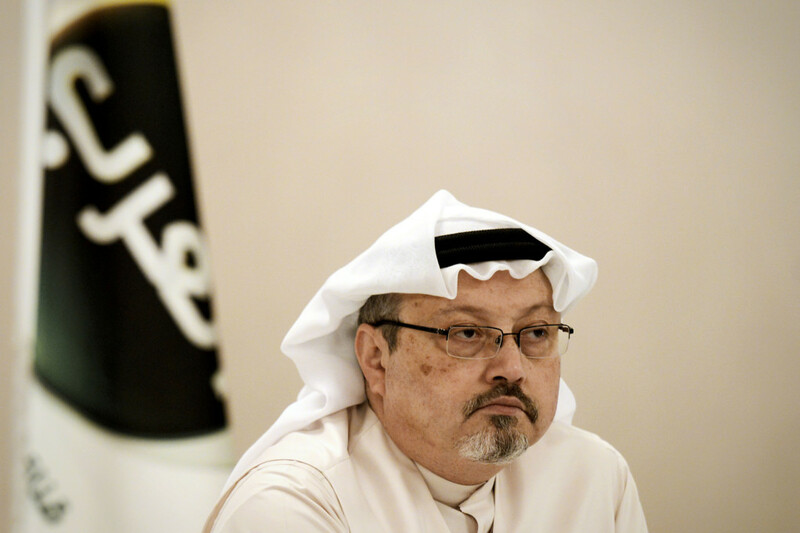 Khashoggi did not deserve his fate but look beyond the headlines, dig deep to see a murky, confusing scenario being orchestrated and designed to serve various competing interests. Whatever Saudi does or says, it cannot win in the current hostile climate. Better to draw a line in the sand and stay mum.